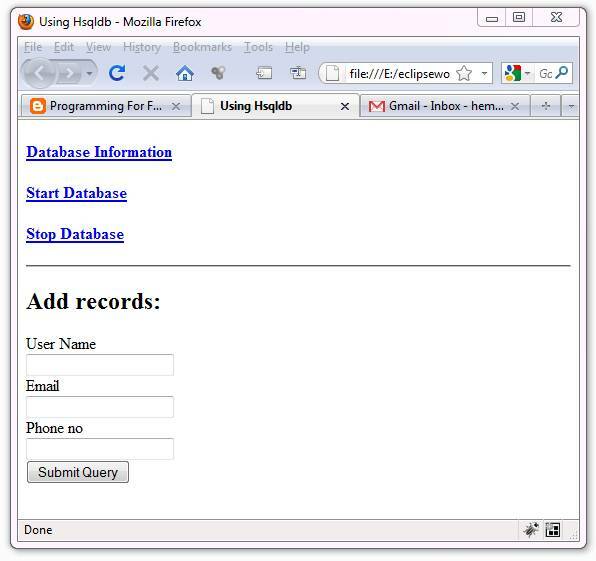 HSQLDB database it a very small database that can be controlled from you application. you can start and stop the database by writing the programming statement. This feature enable to use this database in your application with programmatic control. You can handle the database by writing some java codes. When you use the database with In-Process mode, you will not able to access it other ways. In the In-Process mode, database become the part of your application and it does not run as server on other port number. So using the database In-Process mode is good when you are going to deploy the webapplication on the live server but at the time of development you have to avoid it. At the time of development, you need to look into database table so queckly to see the changes after executing any functionalityies. So you require the way to access the same dtabase from datbase client. But, if the database is running in the in-process mode, it doesn't open any port to access via database client. To access same database from database client, you need to run the database in Server mode. But, if you are handling the daabase programmaticlly, you can access it from database client outside from you application. too hard for me... i need a dummy example of web use of HSQLDB!! This has helped me a lot. Thank you! Good example about how exactly to use the HSQLDB in app dev and finally migrate it to the in-process mode. Nice work !! !